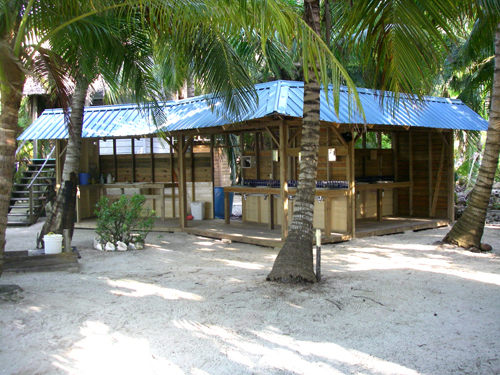 The best time to visit Belize is the period of time known as the “dry season”. Speaking of summer, fall, winter, or spring is not that useful for Belize. Although there is little difference in temperatures between seasons in Belize, like all tropical regions Belize experiences extremes in precipitation amounts depending on the time of year. In the northern reaches of the tropics the climate patterns transition into dry season by February, and continue through May. The rainy season usually begins in June. This rainy season then transitions into the storm season (hurricanes) in late summer and fall. By November the process begins all over again. 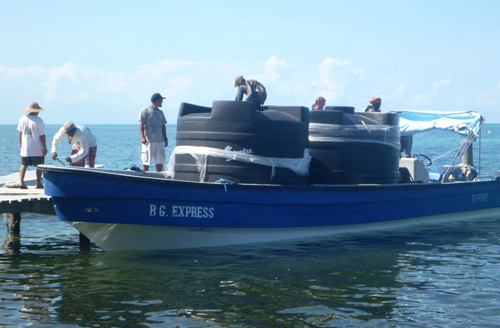 On Long Caye, our island in Belize, the dry season presents a special challenge since we have to provide fresh water for our operation for drinking, cooking, and our wash stands. 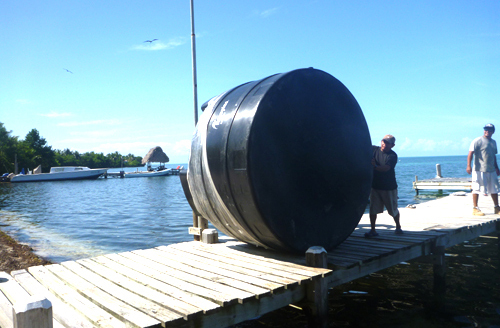 Like all remote regions of Belize, we collect all of our fresh water from our metal roofed buildings and store it in large vats for later use. We currently have 14,000 gallons capacity of fresh water between our 16 collection tanks, and although this sounds like a lot it is always a concern when we are hosting up to 34 guests a week and there is no rain for 2 months! We also have several wells on the island which brackish water, unsuitable for drinking, although we do employ it for the showers and dish washing. Just getting these huge tanks out to the island are a trial, and we have to hire a special boat to transport them to the island. We have to choose a calm day to bring them out, here’s what they look like, arriving on the island. 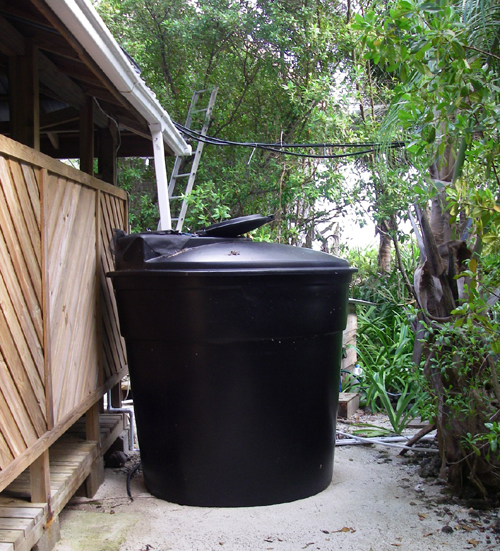 The tanks are installed beneath our roofs with the water transferred by a gutter system. Our groundskeeper closely monitors our fresh water supply during the dry season, when we can expect 8-10 weeks with almost zero rainfall. He transfers water from tank to tank and purifies it as needed. The water stays amazingly fresh in the tanks for long periods at a time since it is pure rainwater with virtually no impurities or other organic content on which algae could grow. We do have two plumbed systems, one to the kitchen and one to the wash stand, but most of the rest of the tanks just collect water, which we transfer with portable pumps. The plumbed systems are pressurized with our 12 V pumps, powered by the sun and our photovoltaic systems.